Okay, I have a confession to make. Instead of revising for my mocks, I somehow managed to end up eating chocolate and reading through weird history facts. Do not ask me how. But, anyway, some are truly shocking (well to me anyway, if you’re a history teacher, you may not be surprised). I think that the most bizarre fact that I have come across is about Adolf Hitler. 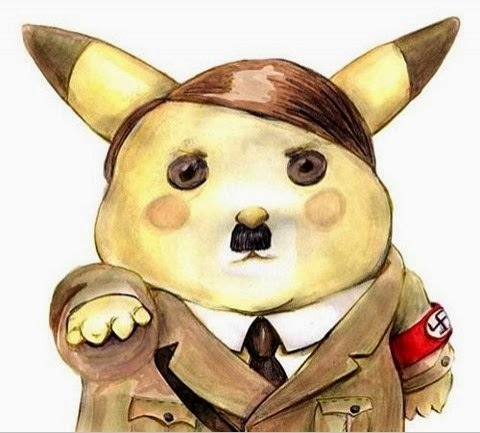 Now, we all know who Adolf Hitler is and what he has done (if you don’t, where have you been?! ), so I’m not going to go into that. No, I’m going to highlight the fact that he got voted ‘Man of the Year’ in the Time Magazine in 1938. The same year in which he: expelled 12,000 Jews from Germany; said that he wanted to crush Czechoslovakia; and threatened to invade Austria. I kid you not! So unless I’m missing something, I think it’s safe to say the world went mad in 1938 (or at least the Time Magazine). There are many more facts that I came across while procrastinating. But if I listed them all out, as well as every site I have been to this evening, I would fail my mocks... and my GCSEs and to be honest I think I would have my computer confiscated which would mean that I wouldn’t be able to write to all of you lovely people! Try not to miss me too much! Today (17th November) I went to a History Masterclass in London ran by the Debate Chamber (http://www.debatechamber.com). In short, we learned about and discussed the purpose of studying History and different approaches to take when writing about a particular event or leader. For example, we covered topics such as the similarities and differences between the Marxist and Annales approaches to History, micro-history, how History should be taught in schools, narrative and analysis in History, the problems posed by the postmodernist view, whether or not a historian can ever really discover/ write about ‘the truth’ and the structure agency problem. I found the idea of postmodernism particularly interesting, that is how History can never be told perfectly because it is impossible to include all the causes of event, how by putting topics in a particular order facts are inexplicitly presented in a way which reflects the historians own views and how the choice of language also affects how an event is reflected. In this way, can ‘the truth’ ever be told in a fully objective manner? Collingwood discusses how a person’s thoughts led to events and so the only way to completely understand History is to put yourself in great men’s shoes, as it were. However, will we ever be able to truly understand what Hitler was thinking, for example? One would have had to live in his society- this is impossible as Germany now is hardly comparable to Germany in the 1930s. Furthermore, we automatically filter everything we learn about through our own experiences (the inclusion of an anecdote featuring an ice-cream van would have a slightly different effect on different people) , therefore even if we tried to put themselves in Hitler’s shoes, every historian would still have slightly different views. No one answer or ‘truth’ could ever be reached. But, surely this diversity is not actually a bad thing? It was a very interactive session which encouraged participants to voice their views on matters and covered ideas and perspectives which I had never even considered before- I thoroughly enjoyed and would definitely recommend it to others. ED. Hello my lovely blog readers, unfortunately for you it's me again. I have to say , this post is really a miracle post. Simply because I remembered to post. It goes without saying that somebody with as notoriously low brain power as myself has a little bit of trouble remembering things. If we're being political with wordings. But I’m not going to be political with wordings, I’m going to call a spade a spade and be honest: my memory is horrendous. We're talking so bad sometimes I think I wouldn't remember to eat unless my stomach told me a seemingly amazing amount of times. For me to remember a date, it must be accompanied by the kind of mad-hatter rhyme that sticks in my mad-hatter brain. So the fact that I remembered today is a feat worth a medal. In fact, I remembered it before it even happened. If that is possible. 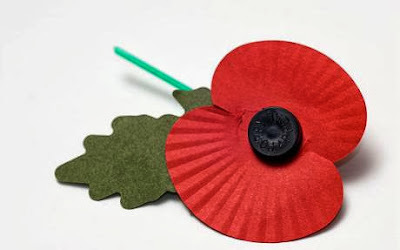 Today is, of course, Armistice Day. I borrowed a pound of a friend on Thursday to pay for my own poppy, and have remembered since then. And it worries me that the amount of people I see wearing poppies has dwindled. Maybe because this is one of the first generations without even parents affected by the war, I don’t know, and I’m not saying people dont care. But sometimes, I think people just forget. Forget Remembrance Day. Not me. It's one of the few things I remember without writing it on my hand. I go down to the local war memorial and I (like everybody else) observe the two minutes silence. Not because I myself have any family connection really to the army, but because I, like everybody else, have great personal connection to the army. Because without them, we would be living in a different world. And I’m not saying that I advocate military action or anything like that, but I’m saying it’s a necessity. A necessity people die for. So really, in light of that, how could I not wear a poppy? Anyway, I have a confession to make. History and Politics are not my only loves. Drama has a hold of a part of my heart in a way that I feel can never been reversed. 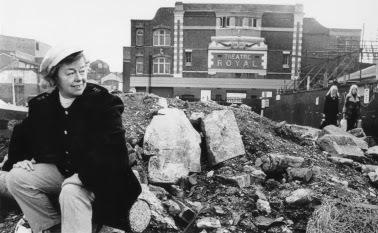 So instead of feeling slightly ashamed that my interests are split, I have decided to combine them, and write about a woman who, to be honest with you, I think is pretty decent: Joan Littlewood. The thespians of you may be aware of some of Joan’s more famous productions, such as Oh, What a lovely War! And A taste of honey, and if you haven't heard of them or seen them, I highly suggest that you do! Littlewood was very left wing, so much so in fact that she joined the Communist party in Britain, and so was banned from banned from broadcasting on the BBC until MI5 investigated and decided she had broken off ties two years later. And I could go on for ages about how all of her productions have really struck a chord with so many people, and how she revolutionised the world of acting, but there are three things that I love the most about her : One, that she tried to make theatre truly accessible for everyone, rather than just the rich ; two, that she refused to go along with the myth spread about that the First World War was almost 'jolly'; and three, that she stuck by her views right up until the day she died.